Have you ever been “wowed” when you weren’t expecting to be? I met up with a friend of mine this week to have a coffee and amble around Loseley House Gardens near Godalming. I have been to the Loseley House before, but never in June when everything is looking so luscious. I think too it was the time of day we went, quite late, just an hour or so before it was closing, and we felt as though we had the place to ourselves. The “wow” hit me when I came across this…. Red is such a challenging colour to use in the garden because it demands attention, but it’s really rather breathtaking here. Predominantly the colour was green, miscanthus, euphorbia, perennials that hadn’t yet come into flower, all anchored in the space by cleverly planted pleached trees. 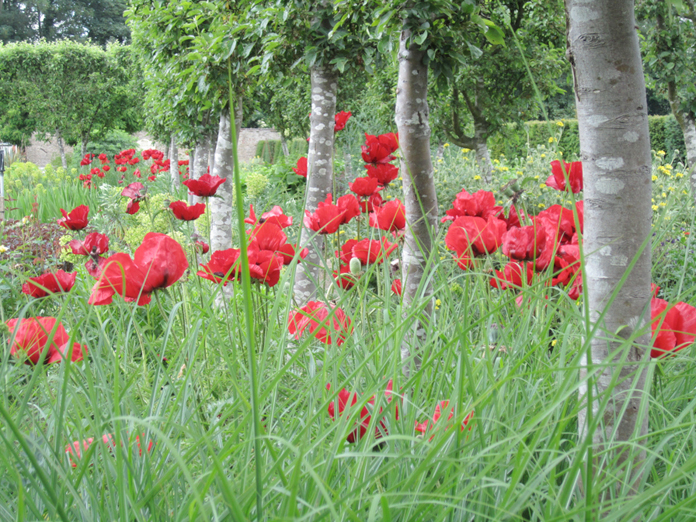 At each corner of the courtyard was a clump of giant red oriental poppies, really fabulous! 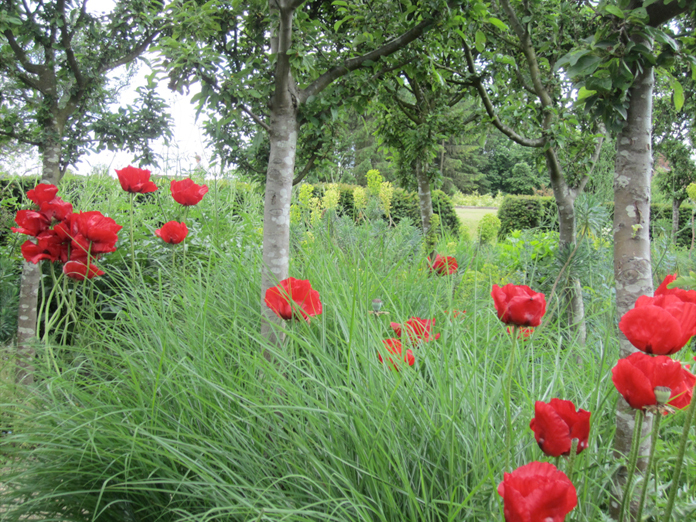 Planting schemes are always more successful when the colour palette is simple and the reason it works here is that the poppies are allowed to do their thing without any competition. Add another strong colour or even another group of poppies in the middle of the space and the impact would be completely lost. Without the red, this garden room would still be lovely, luscious planting, a sense of tranquillity, but I’m not sure it would be very special. This got me thinking about other ways to create this sort of impact with plants that flower for longer, after all, poppies are relatively short lived. Any perennial with a similar habit could work, Alliums or Agapanthus perhaps, although blues and purples wouldn’t really provide the same sense of drama. 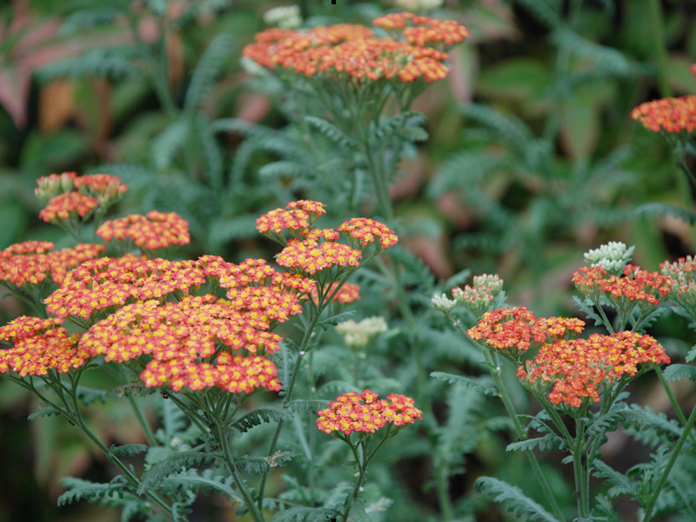 Something like Achillea millefolium might be better – some cultivars are taller than others but ‘Walther Funcke’ (above) would be great for colour. Red or orange Heleniums could also work, ‘Morheim Beauty’ or ‘Rubinzwerg’ would give great impact if planted en masse at key points in the garden…..and the list goes on…….What do you think?